Family Volley: FAMILY FUN FRIDAY-Killer Frog! This game is simple, fast, and really fun. You don't need anything to play. Choose one person to be the "detective". Send the detective out of the room. The detectives' job is to try and figure out who the Killer Frog is. While the "detective" is out of the room, choose one person to be the killer frog, so that everyone knows who the killer frog is, except the detective. Have everyone get is a circle and invite the detective back into the room. Have them stand in the middle of the circle. The Killer Frog, being very sneaky, so the detective doesn't catch him/her, will stick their tongue out (one by one) at the other people in the room. 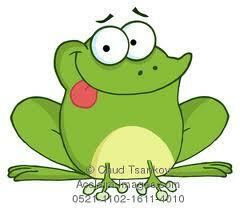 Whoever the killer frog sticks their tongue out at, must fall down on the ground, acting out a very dramatic death. The detective will try to guess who the killer frog is. If the detective figures out who the frog is then he wins and gets to be the detective again. If the frog wins, (by killing everyone before the detective finds out who he/she is) then he gets to be the detective. Depending on the size of the group, we like to limit the number of guesses the detective has. SO...instead of the detective being able to just call out names until they get it right. The detective only has three guesses. That way they will have to use more skill and thought to make their guesses. Has Fall hit where you live yet, or are you still enjoying the summer? My girls would LOVE this game! We're totally going to try it for FHE, or maybe just for fun this weekend! Thanks for these ideas, I love them!